Just a relatively short car trip from the wilds of Alaska, the growing city of Anchorage began its life as a simple railroad settlement. Today, the city is now home to close to 50 percent of the state's entire population and is central to Alaskan commerce and politics, despite the capital status being awarded to Juneau. Sightseers in Anchorage are certainly well catered for, with top attractions coming in the form of the Alaska Native Heritage Center, a large number of very decent museums, and zoological gardens displaying Arctic wildlife. If you would like to get out and about during your visit, then choose between climbing to the peak of the nearby Flattop Mountain or hiking along the scenic Tony Knowles Coastal Trail. 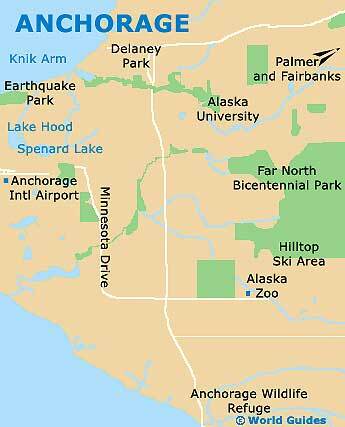 Vacationers considering a visit to southern Alaska should check out the Anchorage links listed here. State of Alaska - Official Alaska state website. Alaska Public Lands Information Centers - Old Federal Building, 605 West 4th Avenue. Anchorage Tourism and Travel Information - 524 West 4th Avenue. Anchorage Museum at Rasmuson Center - 625 C Street. Alaska Native Heritage Center - 8800 Heritage Center Drive. Alaska Aviation Museum - 4721 Aircraft Drive. Oscar Anderson House Museum - 420 M Street. Alaska Heritage Museum at Wells Fargo - 301 West Northern Lights. Alaska Museum of Natural History - 201 North Bragaw Street. Alaska Law Enforcement Museum - 245 West 5th Avenue. Anchorage Alaska Center - 605 West 4th Avenue Suite 105. Alaska Zoo - 4731 O'Malley Road. Anchorage City Trolley Tours - 4th Street and F Street. Anchorage Alaska Bed and Breakfast Association - a cooperative society providing details of local B&Bs and innkeepers. The Hotel Captain Cook - 939 West 5th Avenue. Spenard Hostel International - 2845 West 42nd Avenue. Anchorage Downtown Hotel - 826 K Street. Golden Nugget RV / Motorhome Campground - 4100 Debarr Road. Centennial Campground - 8300 Glenn Highway (off Muldoon Road and Boundary Avenue). Ted Stevens Anchorage International Airport - 550 West 7th Avenue / Postmark Drive. Merrill Field - 800 Merrill Field Drive. Alaska Air Transit - 2331 Merrill Field Drive. Alaska Air Taxi LLC - 4501 Aircraft Drive. Alaska Car and Van Rentals - 854 East 36th Avenue. Avis Alaska - 4900 Aircraft Drive. High Country Car and Truck Rental - 3609 Spenard Road. Alaska Yellow Cabs - 6707 Greenwood Street. Seward Bus Lines - 3333 Fairbanks Street. Alaska Railroad - 327 West Ship Creek Avenue.